Can I File a 1040EZ if I Have a Retirement Plan? 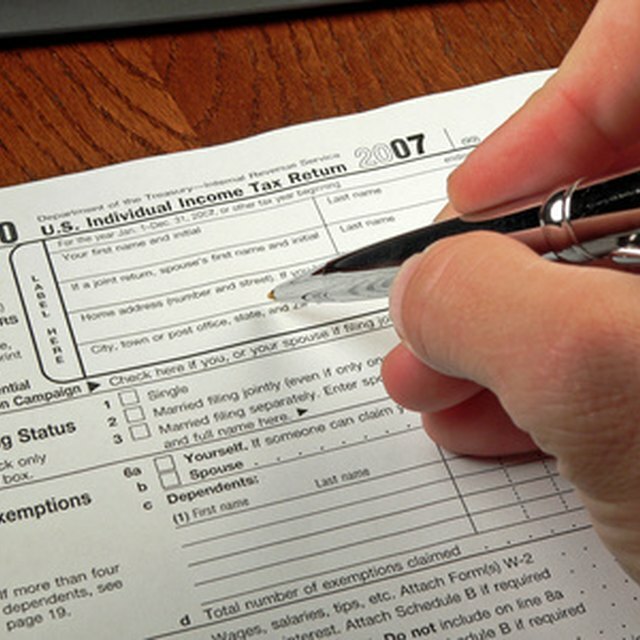 The Internal Revenue Services offers three tax return forms of varying length. Though having a retirement plan might mean you have to use one of the longer tax forms – either Form 1040 or 1040A – you'll be glad you did when you see how much you save. Whether you can use Form 1040EZ (pronounced as 1040 easy) depends on what type of retirement plan you have and what you're doing with it. Taking the time to understand the different 1040 options will allow you to determine whether or not you can rely exclusively on 104ez instructions for your next tax return. If you have money in a tax-sheltered retirement account that you do not withdraw, this will not require any form of year-end reporting. With that in mind, you can still use 1040EZ to report your standard income tax. Contributions to employer-sponsored plans, such as 401(k)s and 403(b)s, are made with pretax dollars, so it's not necessary to deduct them on your taxes. For example, say your salary is $40,000, but you had your employer take out $3,000 for your 401(k) plan contribution (which will be listed on any 401 tax form). When your employer tells you (and the IRS) how much you earned on your W-2, it will show only $37,000 of taxable income. So, because you don't need a line for the deduction, you can still file your taxes using Form 1040EZ instructions and the 1040 EZ tax tables. Contributions to traditional IRAs disqualify you from using Form 1040EZ. There's no room on the form to deduct your contributions, so you'd be missing out on a big tax break. Even if you're trying to make nondeductible contributions, you need to file Form 8606, which is filed with Form 1040 or 1040A, not Form 1040EZ. On the other hand, Roth IRA contributions aren't deductible, so they don't appear on your tax return. So, the 1040EZ is still an option. IRAs and qualified employer plans, such as 403(b)s and 401(k)s, are all tax-sheltered accounts. This means the gains in the accounts aren't taxed as you earn the money – only when you take distributions. So, if you just have money in your retirement plan, but didn't contribute or withdraw, you don't have any tax reporting obligations. As a result, you can still use Form 1040EZ for your personal tax return that year. Keep in mind that even though you may not be able to use the 1040EZ form, the 1040EZ tax tables will still apply, as this is federally mandated across all filing forms. Can You Still Contribute to a 401k After You Start Taking RMDs? Can I Cash Out an IRA for Moving Expenses? Is Inherited Money Considered as Earnings? Is Amount on W-2 Net of Contributions to 401(K)? The IRS allows you to take a tax credit for contributions made to an IRA or employer-sponsored retirement plan if you meet income criteria. If you want to claim the retirement savings credit, you can't use Form 1040EZ. Instead, use Form 8880 to figure the credit and Form 1040 to report it. The saver's credit amount is 50, 20 or 10 percent of your IRA or retirement plan contributions up to $2,000, or $4,000 if you are married and filing jointly, based on your adjusted gross income (AGI). The credit then reduces your tax bill by up to $1,000 – half of your first $2,000 of qualifying contributions. To be eligible, you have to make contributions to a qualifying plan, which includes IRAs and employer plans; be 18 or older; have your adjusted gross income fall below the annual limits; and not be a full-time student. For 2017, single filers cannot have an AGI above $31,000 and married couples filing jointly cannot have an AGI exceeding $62,000 to qualify for the saver's credit. If you're taking money out of a retirement plan, you can't use Form 1040EZ. Distributions from tax-deferred retirement plans, such as traditional IRAs, 401(k)s and 403(b)s, count as taxable income when you take the withdrawal, and Form 1040EZ just doesn't have the lines for retirement plan income. Even if you're taking a tax-free withdrawal from a Roth IRA or designated Roth account, you still have to report that on your taxes, and Form 1040EZ just doesn't have the space. If you have additional questions about the 1040EZ instructions, or are still unsure about which form you should be using, you should take the opportunity to consult with a CPA in order to ensure that you have all of the necessary information. Internal Revenue Service: Topic 352 - Which Form – 1040, 1040A or 1040EZ?